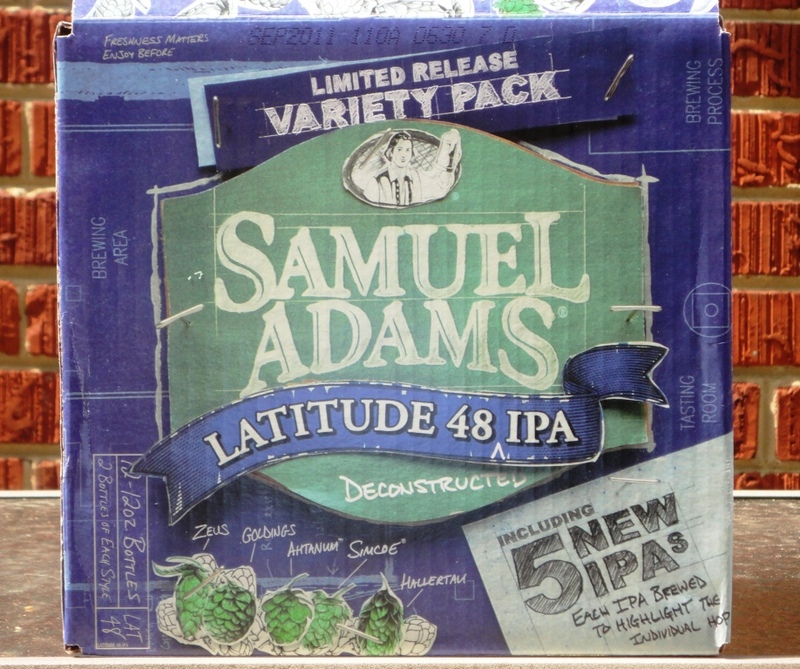 The final post of my three-posts-in-three-days review of mixed 12-packs features the Samuel Adams Latitude 48 IPA Deconstructed variety pack, which I found at Magruder’s, my DC beer store. In his recent column on variety packs, Greg Kitsock calls this 12-pack “a Hops 101 course all by itself.” Indeed! Sam Adams Latitude 48 IPA is brewed with five different types of hops: Hallertau Mittelfrueh from Germany, East Kent Goldings from England, and Antanum, Simcoe, and Zeus from Washington state. All of the hops are from growing regions close to the 48th parallel north, the “hop belt” of the Northern Hemisphere where the best hops are grown. For the Deconstructed 12-pack, the Boston Beer Company brewed five single hop beers – each beer uses just one of the hop varieties found in the Latitude 48 IPA. Latitude 48 IPA, the father of the single hop beers is a drinkable IPA that is well-balanced with five different malts. Latitude 48 Hallertau Mittelfrueh IPA, a hopped up version of your basic Sam Adams Boston Lager, brewed with the same hop as the brewery’s flagship beer. Latitude 48 Antanum IPA, these hops contribute a balanced orange peel, piney, and floral flavor and aroma. Latitude 48 Zeus IPA, my favorite of the single hop beers, Zeus hops contribute bitterness and an intense, pungent resinous pine flavor. Latitude 48 Simcoe IPA, these hops contribute a profound bitterness and dramatic grapefruit peel and pine resin notes. Latitude 48 East Kent Goldings IPA, the most mellow of the IPAs is a nice counter to the aggressive hops from the United States. This was a fun 12-pack to sample over a weekend afternoon – a must-try for the hop head.